In the last fall economic update, the Liberal government announced that beginning of July 2018, Canada child tax benefit payments will be adjusted as the cost of living increases – almost two years earlier than initially announced. The change will also see the qualification threshold for families adjust along with the cost of living. Speaking to the House of Commons, Morneau credited the government’s child-tax benefit program for helping to elevate the economy. “Now, with a little more wind in our sails, we’re doubling down on a plan with proven results,” he said in his speech. 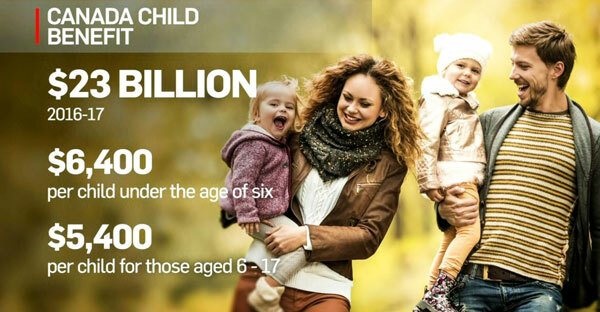 The child benefit adjustment means the government will be paying out an additional $5.6 billion over five years, between 2018-19 and 2022-23, to families with children aged 17 years and younger, according to the economic update presented on Tuesday. As an example, the government said a family currently receiving the maximum amount of $6,400 per child under six years old will, as of July 2018, see that amount to rise to $6,496, and to $6,626 by 2019-2020. Morneau’s economic statement published Tuesday promises $14.9 billion in fresh spending over the next five years – on top of what it had outlined in its March’s budget. The Liberals rolled out their $22-billion version of the child benefit in July 2016, replacing the previous government’s one-size-fits-all payments for families with children under 18 years old. Whereas the Stephen Harper Conservatives sent all qualifying families the same sum, the Liberal system moved to a means-tested approach, ensuring families with lower incomes receive more money than families with higher incomes. Another difference between the Conservative and Liberal benefits was what each meant come income tax season; the Liberal benefit is not taxable, while funds received through the Conservative benefit system was considered taxable income. Since the Liberal Canada Child Tax Benefit rolled in, the families with children younger than six years old have been eligible to receive a benefit of $6,400 annually per child, while those with children between six and 17 years old have been eligible for up to $5,400 annually. Those maximum payments are reserved for households earning $30,000 per year or less, with benefits decreasing as household income increases. In a report published last year, the Office of the Parliamentary Budget Officer estimated the existing Liberal system would cost the government $3.4 billion more than the old budget in 2016-17. In that report, the budget officer noted the “real value” of the benefit would decrease over time as a consequence and, as a result, the cost to the government would also decline, falling to $2.5 billion by 2020-2021. The office’s estimates indicated a few years after that, in 2024-25, total spending on the Canada Child Benefit would fall to that of the Conservative child benefit scheme. Similar research from the budget officer found indexation will cost $300 million in the first year of implementation, rising to nearly $5.8 billion in the seventh year.